Driver assistance technology that can prevent accidents is now available on almost 7 in 10 cars on the market, helping drive down the number of accidents on UK roads, according to the Society of Motor Manufacturers and Traders (SMMT). Latest data from the SMMT and JATO Dynamics shows that some 66.8% of new cars are offered with at least one self-activating safety system, either as standard or as an optional extra. Nearly 1.8 million new vehicles in 2016 came with collision warning systems alone, up 20% on the previous year. AEB, which automatically applies the brakes to avoid or reduce the effects of an impact, is available on more than half (53.1%) of new cars, with a quarter featuring the technology as standard. Meanwhile, overtaking sensors are available to 42.1% of buyers and 36.2% have Adaptive Cruise Control, which allows the car to slow down and speed up automatically while keeping a safe distance from the vehicle in front. Parking assistance technology, including cameras and sensors, is available as standard or as an option on 58.8% of new cars. 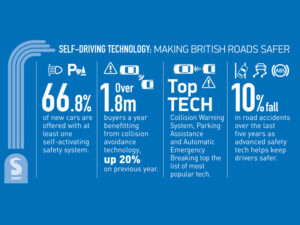 According to the SMMT, road accidents in the UK have fallen by nearly 10% over the past five years due to the innovations in automotive safety, and are set to fall further with new developments. This year for example will also see the showroom debut of technologies including Traffic Jam Pilot, which enable the car to take over the task of driving in slow moving traffic or queues in certain situation; as well as smartphone – or key fob-controlled remote parking; and pre-collision warning systems, which detect vehicles, pedestrians and cyclists.